Dan Snowdall and I struggled with defining Democratic Relativism while simultaneously comparing the various models discussed in class over the last few weeks. We were completely flummoxed by the undefinable nature of the concepts we were discussing and have been challenged with giving the concepts some form. Coming from an undergraduate degree in Government as well as History and possessing general proclivities toward systems modeling I needed a picture. Today, we grappled with the various concepts and settled on the models and definitions as briefly listed below. We ask for comments AND CORRECTIONS if we are wildly off-base or confusing. We look forward to the discussion! Quantitative discovery dynamically shifts weight with intangible political “beliefs” as strength of one over the other balance each other out in the “Reality of the Process”. General questions first: Are the sizes of the circles important? Do we read from the top down? 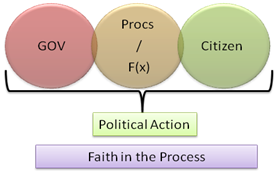 For example, in Jeffersonian Democracy: small government and the political process overlap in political action, and a large citizenry in process overlaps with political action at the local level? 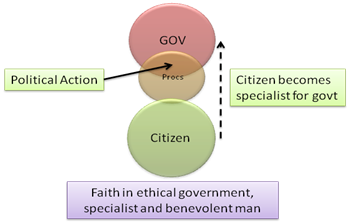 And the key component is faith in the citizen? 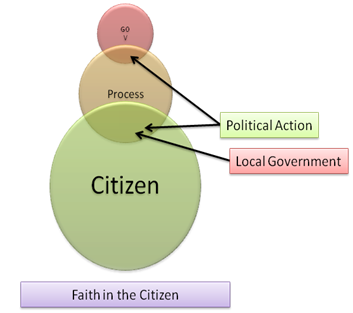 Then in Hamiltonian Democracy, government is big, and the key component is faith in the government so the government circle is larger than the citizen circle. For me, I found the text descriptions work better. The diagrams are a little confusing for me. It’s hard to see the underlying structural assumptions in size and hierarchies. I see that you’re trying to put the same components in each form of government. I’m afraid I have to ask “the question”: does size matter? And does Orientation matter? 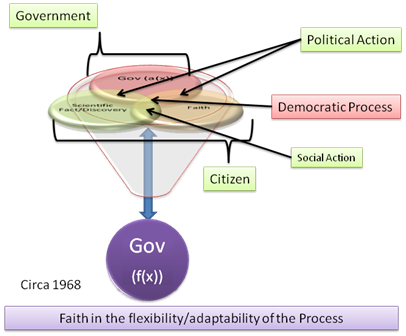 Here’s how I understand your graph of Democratic Relativism: Government, Scientific fact/discovery, and intangibles all interact together, creating the democratic process. 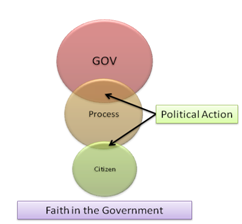 Interactions with government are political action, while interactions without government are social action. 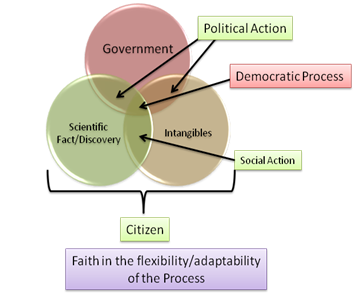 The citizen is NOT involved in government but in science and intangibles, and the key component is faith in the flexibility of the process. In this setup, flexibility is almost required, there is room for irrationality, and the political process is more of a balancing act. Did I get that right? There is a lot of information crammed into each of the diagrams. I think it needs to be unpacked more.